Vintage From Paul is pleased to offer these Elements Winter Garden Crystal Set of Four Dessert Plates. The Elements Winter Garden Crystal Four Dessert Plate Set are richly edged in 24 carat gold. The plates themselves is a study in contrasts between alternating frosted and clear glass. The design is of grape leaves and luscious bunches of grapes. The Elements Winter Garden Crystal Four Dessert Plate Set are in pristine condition with no defects or flaws noted. they would arrive in their original box. 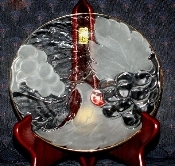 The Elements Winter Garden Crystal Four Dessert Plate Set measure 7 inches in diameter. Winter Garden is suitable for year round use and would be smashing with cheese, crackers and a glass of wine.